Mill Club Condo in Copper Mountain Colorado Real Estate is located in the Center Village at Copper. This ski in ski out condo in Copper Mountain is right at the base of the American Eagle lift. Luxury awaits you at Mill Club Condo as most condos have granite slab counters and slate entries. Built in 1999, there are 31 condos in Mill Club comprised of 3 – one bedrooms, 17 – two bedrooms and 11 – three bedroom residences. The properties range in size from 622-1779 square feet. Mill Club Condo has the most three bedroom condos out of any of the newer condo complexes in center village. Taylors Crossing has five three bedrooms, while Tucker Mountain Lodge and Copper One Lodge have none. After a delightful day enjoying the numerous outdoor activities available to you in Summit County Colorado, take time to enjoy the amenities at Mill Club Condo. Relax in the spacious, well decorated lobby, indoor hot tub, steam room, sauna, fitness room, ski storage for guests and owners, underground parking and additional storage in the parking garage. 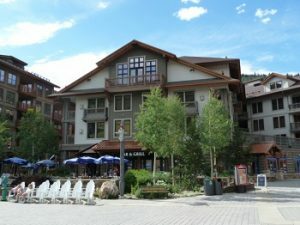 Mill Club Condo in Copper Mountain CO has everything you could want and being ski in ski out in Copper Mountain is an added bonus. Depending upon the units location you could enjoy breathtaking views of the ski slopes, the lake or the sky chutes. When looking for condos for sale in Copper Mountain CO, arrange a time to view the condos for sale in Mill Club. Let Justin and Krystal Knott with LIV Sotheby’s International Realty work for you to find you and your family the perfect property in Copper Mountain Real Estate and Summit County CO Real Estate. We are full time Realtors that work hard to earn your business.